This Saturday, October 6th Betsy of Stonehouse Studio and Angela of Ambient Designs will be sharing a booth at the Providence Open Market. With an abundance of colors, sounds, aromas, and a strong community spirit in the air, the Providence Open Market is a gathering of groups working together for a common community goal: to give Providence a unique center for art, healthy edibles, fragrant blooms, DIY crafts and designer wares from established and emerging artisans including. At the market you will find jewelry, handbags, accessories, sculpture, and clothing along with affordable mid-century modern furniture, antiques and collectibles. 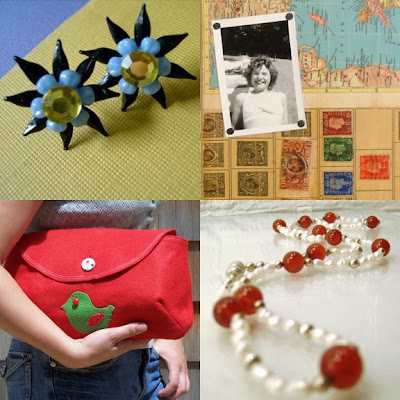 And on Sunday, October 7th there will be TWO Boston Handmade booths at the South End Open Market in Boston featuring work by Glamourpuss Creations, Reclaimed To You, Elizabeth Brennick Designs and Zesty B. The South End Open Market offers a shopping experience like no other in Boston. With an ever-changing group of artisans, a hip location and the chance to feel the sun on you face while you browse - it's a trip worth making. The Market offers the opportunity to meet the artists, vendors and farmers behind the work, and is fast becoming part of the South End's well-known artist's community. Every week offers shoppers something different and unique - check it out!